It rained yesterday in Fresno. Normally the rain stops in April and we don't see it again until November. But yesterday it was cool and rainy. But it did make the yard look so cool and refreshing. And yes, we really do have a trombone as a water fountain. We also have one that I use as a quilt rack. 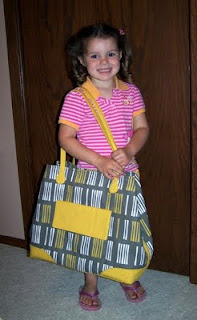 Yesterday when I posted about the Weekender Bag finally being completed, I added a picture of Courtney, who is the granddaughter of my friend, Candy. She was posing with a bag that Candy had just completed and she looked so cute. "May the Lord bless you and keep you. May the Lord make his face shine upon you and be gracious unto you. May the Lord turn his face toward you and give you peace." I asked my dad what the scripture passage was and he said it was Numbers 6:22-26. When I looked it up in the Bible, I was shocked to read the verses immediately before, which were: The Lord said to Moses, "Tell Aaron and his sons...." Aaron is our son's name and I knew at that moment that it was no accident these verses were running through my head and giving me peace. 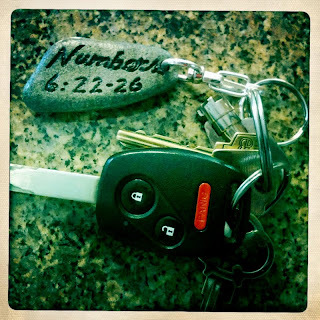 My friends, Dave and Debbie, engrave words on rocks, and they made this for my keychain. Isn't it awesome? The rain stopped by noon and the rest of the day was beautiful. We ate supper outside. I leave for Minnesota a week from today for a quilting retreat. I'm taking my Featherweight, named Bonnie. Mark is used to my penchant for naming things, like quilts and his fused glass creations. For some reason he thinks naming my sewing machine is silly and never calls her by her proper name. I don't think naming her is silly at all. Her case even has her name on it. You're taking Bonnie along, right? I love all your randomness! Enjoy the "cooler" temps today. Gah....do your flowers bake or fry in those high temps? The key chain is so thoughtful and a lovely gift. I once stayed at a B & B where the towel rod was a trombone and the bed was made out of a piano. How's that for random?! Now if only I really were cool... literally... mid90's today and extremely humid. Yuck. Okay, first? I want to come to your house - for the trombones alone! Aweseome! I name things, too - my first car was Betsy, then we sold her and bought Elaine. Our current car is Goldie. I chose that particular blessing for the final blessing at our wedding; I still love it. I'm so glad you had a scripture given you to help you through that painful time. I love it when I can see and feel the God's workings in my life. Even though we know he's there, its nice to have nudges. I love that blessing, our church uses it quite often to close a service. We had it for each child's baptism service. I love those verses. It looked too sunny to be raining. You can always photograph rain dripping on the pavement. Well, we do with puddles and all. Not only to I love the trombones, but the farm milk bucket and all other garden art. She will be forever and always called "Bonnie"! Does "featherweight" mean small and light, as in not heavy? Do you name your objects after first learning the personality? Or do you name first? Do the names fit? In the quilting world, do all quilters name their quilts? Does Bonnie have a nickname? I only have one simple machine, a Janome, that my Mom gave me. It's fine for my little projects, but I am sure I would love more bells and whistles. Perhaps she needs a name . . . . .
Love this post! And I too love it when God nudges us a bit. It's a shame He has to remind us He's still working. I thought it was hot here in Arkansas. Woo wee girl. Love the bag in the Jessica Jones fabric. I have the pea pods from her first line. The weather was lovely here yesterday, too, and we sat out on the patio last night and enjoyed dinner at a friend's house, overlooking the valley below. We couldn't believe how pleasant it was. No worries--heat's back today. Have fun on your retreat! I hope you'll post about what you're doing. I love your trombones!!! Especially the trombone quilt holder :) Another quilting retreat? Awesome! I can't wait to see what you work on! Loved the rain! It reminded me of some summer days in Minnesota. Terry leaves for "God's Country" Wed July 6 and I on July 11TH. the Lincoln Log project is starting! When and where is you quilt retreat? I heard about your rain up there....amazing! It didn't reach us. Your keychain stone is such a lovely gift. I can imagine how much you appreciate it. Have a fabulous time at retreat. I'm bringing my featherweight too! Can't wait to meet you! The 90's are supposed be over when you get here in Minnesota, just the high 80's all weekend.